This looks CRAZY GOOD! Is it wrong I want to bathe in it? Oops, I typed that. If loving gravy is wrong, I don’t wanna be right. Ha! Chris offered about 5 times while I frantically searched for something–anything!–that I could put the gravy in without having some really bizarre photos for this post. Finally, I was like, “Okay, go get me a gravy boat!” Pretty sure his ulterior motive was stopping at Starbucks while he was at Target. I love shallots too! Shallots don’t get enough love. HAH gravy in a water pitcher – delicious, brown and chunky. I actually do have my mom’s old gravy boat taking up space in my cabinet; I think I’ve used it a total of once. I love the sound of a mushroom and shallot gravy! Well, the good thing about hand-me-down gravy boats is that at least you’ll have one on hand when you need it. 🙂 No water pitchers for you! I want to swim in that bowl of gravy! Yum! This looks amazing! What could I use instead of the white wine? Any alternatives? I’ve used red wine too. But if you’re wanting to use something non-alcoholic, I’d just omit it altogether. I really love the flavor wine adds and there’s nothing that can really duplicate that flavor! this looks great, but where does one get 2 1/2 cups of mushroom stock? There’s a link in the ingredients to my mushroom stock recipe, but Pacific Natural Foods has a great mushroom broth that would work too. That is so funny about the gravy boat because after I decided to make gravy I realized that I didn’t have a gravy boat!! I just went with small bowls that looked like maybe if you used your imagination they resemble a gravy boat. Your pictures look awesome though, totally worth it!! I thought about going the bowl route too, but I didn’t have a bowl that felt right. 🙂 I think gravy boats are one of those things you don’t realize you need until you’re in the midst of making it! Oh yum. I like that this can be made ahead of time. I always fuss around with the turkey gravy and am disappointed with the results. This year I’ll make this ahead of time and have nothing but smiles! I wonder if a mason jar could stand in for a gravy boat? In a pinch it just might! The first thing I feel with this post is RELIEF! It’s so difficult to find decent, vegetarian Thanksgiving gravy! I love finding gravy recipes that are not meat-based. This sounds SO perfect for Thanksgiving! LOL I saw that gravy boat alternatives post on the kitchn, but I also saw one on huff post taste that was something like “most wacky gravy boats”. There’s some really funny ones there. I’ve never tried making my own gravy (just used packages) but I definitely want to, and this mushroom one sounds awesome! I need to go Google that post. 🙂 My mom used to always make vegetarian gravy for me and my brother from those packages too! Now I want a gravy boat! I’m definitely gonna make that gravy (it looks amazing!) so I have to have one – right?! Homemade mushroom stock is my secret ingredient in a lot of recipes. 😀 It’s good stuff! I’ve totally done that before! Thinking I have something when I don’t…I’ve even done the reverse of thinking I don’t have something, going out and buying it only to find one in a cupboard a week or so later…but most importantly, this gravy looks awesome! Yes, I have done the reverse too! 🙂 I think my problem is that I have my kitchen stuff in so many different rooms (small kitchen! ), it’s hard to remember what I have! I don’t have a gravy boat either but I never make gravy .. I’ve been craving gravy and mashed potatoes so much lately though so I might have to make this soon! Also that’s so cute that Chris took different pictures of the gravy boats for you to choose – so thoughtful! I love that Target saves the day. This gravy sounds fantastic! What would we do without Target?! Packaged shiitake mushrooms. Are you referring to dried shiitakes or something else? It looks wonderful. Fresh shiitake mushrooms. Unless you’re buying them in bulk, they’re usually sold in 3.5 ounce packages. I’ll clarify that in the ingredient list right now! 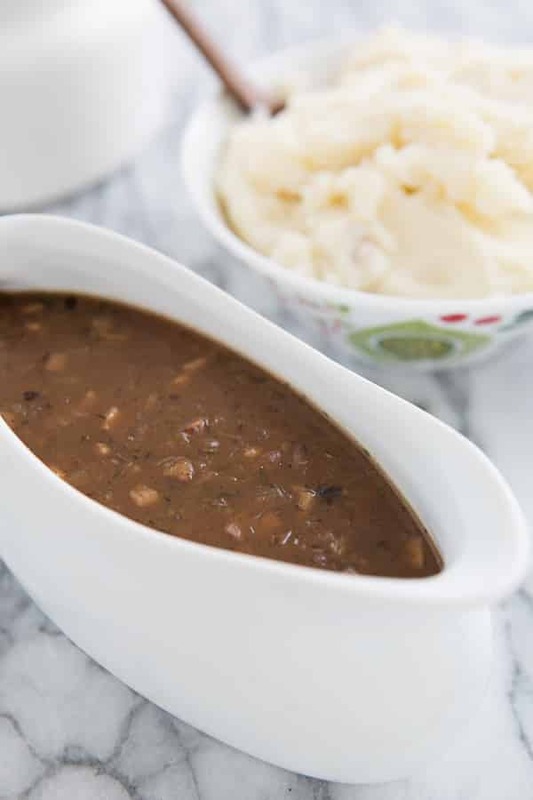 Mashed potato and gravy… drool…. 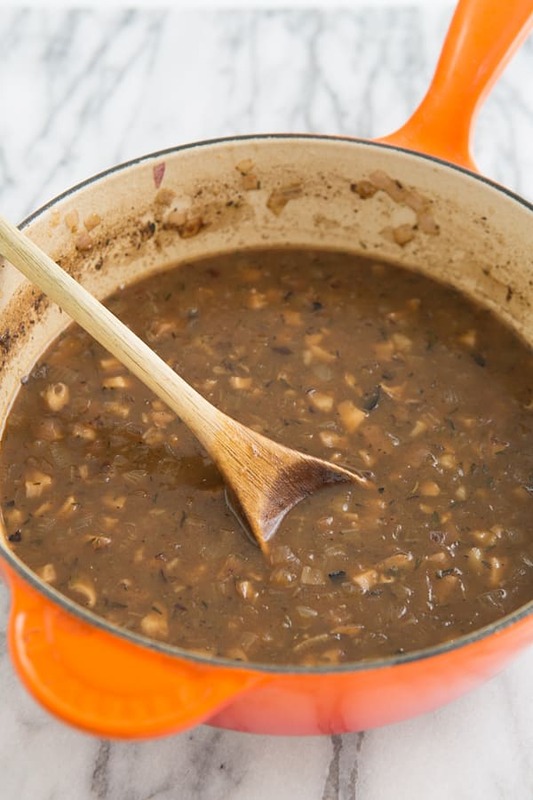 Love how rich this gravy looks – no one would ever guess it’s made with just veggies! Mushrooms are my go-to to add meatiness to any dish. Mushrooms are one of my favorite meat subs too. I love that savory flavor! This gravy looks absolutely divine! What a great idea for Thanksgiving. Yeah, I could definitely eat this with a spoon. 🙂 I loooove gravy!